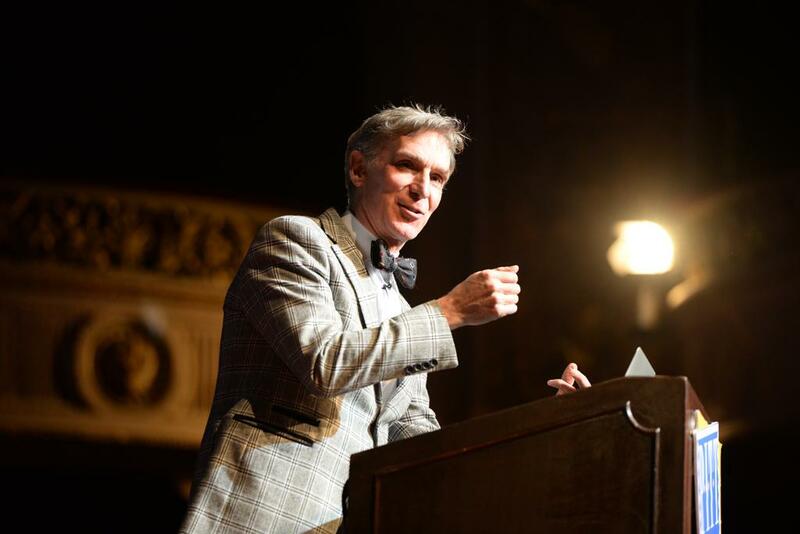 Capping a lecture that transported audience members back to the third grade, Bill Nye tied his signature bow tie on stage, prompting a standing ovation from the audience. Nye rose to fame in elementary school science classes around the country in PBS and Disney’s “Bill Nye the Science Guy,” which ran from 1993 to 2011. Last Friday night, he took Pitt students on a didactic nostalgia trip at the Carnegie Music Hall in Oakland, sponsored by the Pitt Program Council, which focused largely on climate change but also managed a few jabs at Republican presidential candidate Donald Trump along the way. PPC’s Facebook page announced the free event, which was originally scheduled for April 18, but was moved to last Friday because of an undisclosed emergency. Zach Linn, PPC’s advertising director, said some students returned their tickets, which were free, but Nye still managed an impressive turnout, giving away 1,800 tickets in under five hours. Nye’s show isn’t the only reason he has managed to stay in the limelight. In 2013, he danced with professional dancer Tyne Stecklein to Daft Punk’s “Get Lucky” on “Dancing with the Stars.” He also held a theological debate with creationist Ken Ham in 2014, which quickly circulated around the Internet — the video, “Is Creation a Viable Model of Origins?,” has reached more than 5 million views on YouTube. Nye’s presentation began with a bit of personal history, crediting his father as the reason he became the beloved Science Guy. His father, Edwin “Ned” Nye, developed an interest in sundials after spending time in a Japanese internment camp during World War II, where there was no electricity or a way to tell time. Nye himself still harbors an interest in sundials, he said, following his father’s plan to turn the Washington Memorial into an enormous one. He listed his successful inclusion of a sundial on the Mars Exploration Rover missions, explaining that the shadows’ colored tints indicate the color of the atmosphere. Nye was playful with the audience throughout his presentation, both asking questions to the crowd and responding to the crowd’s impromptu answers. In one instance, after Nye made his student audience confront their own age by announcing he is 60 years old, a student from the first balcony called out that he is a “silver fox.” The ever-cool Nye, unphased, responded with a simple “thank you,” prompting the audience to once again erupt in laughter. Although Nye kept the night comedic and light, he reached a more serious tone when the lecture arrived at climate change, a topic of great concern for the comedian and scientist. In urging students to take care of our natural environment, Nye constantly told students in attendance to “change the world,” pointing to rising sea levels and global temperatures as evidence for action. He also made the case for renewable energy — which he said would bring 480,000 new jobs — while combating issues, such as how tropical storms cost taxpayers money and plummet gas prices, both of which are bad signs for the environment. Just like in the era that made him famous, Nye demonstrated he can still connect to his audience — mostly liberal young adults. In addition to incorporating hip lingo in his lecture such as “dude,” “are you high?” and “btw,” he also made humorous remarks about Republican presidential candidates John Kasich, Ted Cruz and Donald Trump. In one of the strongest jokes of the evening, Nye commented on Trump’s anti-climate change remarks as a conspiracy created by the Chinese. He also made fun of Trump’s view that Hawaii is not a real state and criticized Trump’s skepticism of the credibility of President Obama’s birth certificate. For many students, just being in the same room as Nye — the king of educational entertainment — was reason enough to attend. “[I came] to post an Instagram picture, so I could say I went to see Bill Nye,” Grady Martin, a junior geology major, said. By the generation that largely grew up watching his TV show, which taught many of today’s undergraduates how to build a paper mache volcano or capture and study fruit flies, he’s remembered for making science class fun. “He is an iconic childhood hero,” Birmingham said. Although Nye discussed mature matters Friday, he still managed to reward the childhood sentimentality that drew people to the event.